Apple has been accused of submitting doctored evidence to a German court that ultimately granted it an injunction against the sale of the Samsung Galaxy Tab 10.1 in Europe. Apple scored a big blow against Samsung in a German court last week, winning an injunction against the sale of the Samsung Galaxy Tab 10.1 in Europe over claims that the Samsung tablet infringed upon its patents "with respect to aspects of the iPhone/iPad's design and GUI." 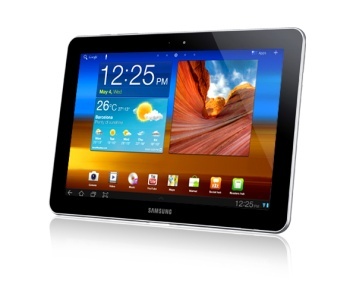 The injunction was modified today to include only Germany, meaning that Samsung can now legally sell the Tab 10.1 elsewhere in Europe, but now it looks like even that limitation may soon be lifted. The Dutch website Webwereld [Google translated] has found that the images of the Galaxy Tab 10.1, which were presented to the court side-by-side with shots of the iPad to demonstrate that it is nearly identical to Apple's tablet, were manipulated to make the device appear more like the iPad than it actually does. The aspect ratio of the Tab image was changed from 1.46 to 1.36, giving it an eight percent increase in width and putting it closer to the iPad's aspect ratio of 1.3. The site quoted attorney and IP expert Arnout Groen as calling the move "a blunder" and saying that the doctored image submitted to the court "can hardly be a coincidence." And while German IP consultant Florian MÃ¼ller said he doubts whether there was any malicious intent involved, Apple could still be on the hook for some serious damages if the court decides to overturn the injunction.